Back of the Cereal Box: The Subspace Emissary: A Shout-out to Super Mario Bros. 2 and Wrecking Crew? The Subspace Emissary: A Shout-out to Super Mario Bros. 2 and Wrecking Crew? NOTE: If you subscribe to the "games only" feed of this blog, you maybe be confused as to why this is showing up. In truth, this is a re-post of an entry I put up on another blog quite a while ago. However, given that Back of the Cereal Box has focused more and more on gaming, I feel like it belongs here. Consider this posted for posterity’s sake. Correct me if I’m wrong, but isn’t this a pretty obvious Super Mario reference? In Super Mario Bros. 2, Mario and company could toss a potion onto the ground and create a doorway to another world called Sub-Space in which day became night, turnips became coins and the organ grinder theme of the game reverted to the original Super Mario Bros. theme. I’ve always assumed that the name Sub-Space was a play on the name of the game’s setting, Subcon, which itself was a play on the word subconscious. It would certainly go along with the general surreal feeling of Brawl’s odd single-player mode, what with the bazillion crossovers and the blending of game series that would normally have nothing to do with each other. It’s even weirder to me that Nintendo seems to be setting up this mode to be taken rather seriously. The apparent Super Mario Bros. 2 homage wasn’t the only surprise. In the short video posted of part of a Subspace Emissary cutscene, Mario and Kirby get attacked by strange robot-looking dudes who fall from the sky and seem to assemble themselves out of nothing. 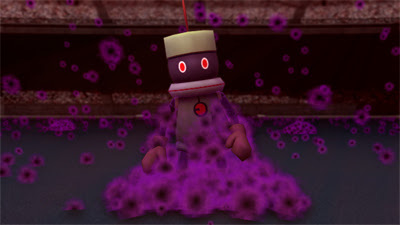 They also look a hell of a lot like the Eggplant Men, the generic baddies from Wrecking Crew. The Brawl creatures are clearly the dumb, anonymous grunt-type enemies that so often populate video games, so maybe that’s part of the resemblance. But am I totally off base on this one? The Eggplant Man — or Nasubi Kamen, “Masked Eggplant,” as it's known in Japan — might provide a common enemy for both Mario, who battled with him in Wrecking Crew, and Pit, who fought a similar baddie in Kid Icarus, the Eggplant Wizard. In any case, there’s some very strange and surprising stuff going with this game.